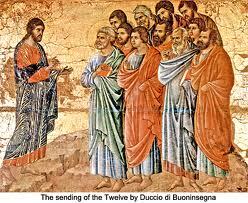 Jesus sends out 72 disciples on a missionary journey, granting them significant spiritual authority. Wasn’t that risky? As Jesus traveled to Jerusalem from Galilee for the last time, St. Luke tells us He commissioned 72 disciples “whom He sent ahead of Him in pairs to every town and place He intended to visit.” In His reliance on others to help Him proclaim the kingdom of God, He reminds us of Moses, who commissioned 70 elders to be prophets in Israel during the Exodus (see Num 11:24-25). The Sanhedrin, with its 71 elders, modeled itself after this leadership structure. Why 70? In Genesis, we find that there were 70 nations that formed the foundation of the ancient world. The ministry of approximately 70 disciples, therefore, anticipates a worldwide spread of the Gospel. Jesus gives specific instructions to the disciples. This is to be a brief expedition, because Jesus Himself will follow after their visits. No need to pack and prepare for a long stay. Because of its brevity and urgency, announcing the arrival of Jesus, they must avoid all distractions (“greet no one along the way”). They are to accept the hospitality of those to whom they are sent (“the laborer deserves his payment”). This is the principle, often repeated in the New Testament (see 1 Cor 9:14; 1 Tim 5:18) that those working in the service of the Gospel are to be supported by the beneficiaries of that service. The Church, therefore, following this instruction, obligates her members to contribute to the Church from their earnings (see CCC 2043, 2122). We give our tithes not because the priest asks it of us, but because Jesus does. The disciples are to cure the sick and to preach the coming of God’s kingdom. Those who do no receive them are to receive a warning. Jews were familiar with this action of shaking dust off their shoes. They did it whenever they traveled into Gentile territory and then returned to the Holy Land. It was a sign that they wanted to separate themselves from the uncleanness of the pagans, who lived outside God’s covenant. For the disciples to use this gesture against Jewish towns that refused to receive them or Jesus would be a strong statement indeed, because it would suggest that the covenant people of God, by this rejection, were actually rejecting that covenant. Stiff medicine! When the 72 returned from their work, what did they first want to tell Jesus? “Lord, even the demons are subject to us because of Your Name.” Ah, yes. Might we have expected this? And isn’t this why it was risky for Jesus, then and now, to build His Church through human beings? The disciples returned with heady excitement over the authority they were able to exercise. It can be intoxicating to have power like this. Jesus acknowledges that His kingdom makes advances against the forces of Satan through the laborers in His Church. However, He warns them not to “rejoice because the spirits are subject to you, but rejoice because your names are written in heaven.” It will not be apostolic success that matters eternally; it will be the obedience that comes from faith that will write our names (and keep them) in the heavenly “book of life” (see Ex 32:32; Ps 69:28; Dan 12:1; Rev 3:5). Jesus was willing to take the risks that come with building a human Church, sharing His authority and power with mere men. What a remarkable statement of God’s love for the creatures made in His image and likeness. May He give us grace to walk worthy of it.